The Seed Roleplaying Community » Steambaths » And you? What are you eating tonight? Re: And you? What are you eating tonight? Okay.. Time for me to try this thing.. I just made some late night snack that is actually very versatile dish, more on this in the end. In Finland we call these "Letut" (Lettu in singular) and its sort of something like the american pancake. You decide what you want to call this. On with the show. Okay lets start. First take the eggs and break them in the bowl. Then mix them up just a bit so its easier to add the milk and it mixes better. After that pour in the milk and mix it up a bit again. Next you add all the other ingredients but save the wheat for last. I also added some vanilla sugar to make it just a bit sweeter than with just sugar. You can experiment with various flavours here, I hear some people add in some cocoa powder to make it a bit chocolaty(?). The amount of flour is quite variable I like the batter(?) to be a bit firmer /but still very flowing!) and some like it to be more liquid. I find it easier to fry the pancakes when its a bit firmer. If you like it more liquid use less flour than in the recipe, like 2 dl. Let the batter rest for 5 minutes or so. Then put the stove to the max and when the frying pan is hot add some butter or oil (butter definitely makes it taste better). When its sizzling hot add some batter on the pan, I'd say about 0.5 dl - 0.75 dl, so that it covers about 3/4 of the pan and while you're pouring it on the pan use your other arm to turn the pan in various directions so the batter spreads evenly on the whole pan. I usually let the stove be at max (my stove has 6 different heat options) for the first two or so that the pan is hot enough and then ease up a step or two depending on how good the stove is.. If your stove is too hot the pancake will burn before the batter loses the shine and then it will be very messy to turn it over if you dont wait for the batter to cook from the top too. After you've finished with the batter and have a stack of pancakes its time to eat! This time I had some raspberry jam to spread on the pancake. Then roll it up and eat! Many people also have some icecream on the hot pancake, whipcream is delicious too and some like it with just a teaspoon of sugar. Just let your imagination run wild! 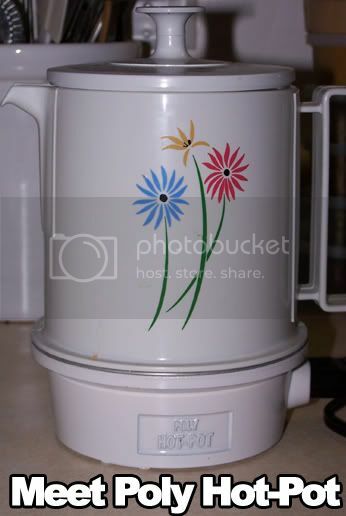 Also if you leave all the sugar out from the recipe you can make a delicious main dish out of this. Boil some rice and fry some minced meat, mix them together as a sort of risotto, make the pancakes (without the sugar), put that risotto as filling, roll it up, put the rolled and filled pancakes in a dish, cover with some cheese and put it in the oven for a while so the cheese melts and voila! Of course you can use just about anything as the filling, mushrooms, vegetables etc etc. Well I hope this makes any sense since I had some trouble with some words there but I tell you this is very simple and very delicious! Enjoy and bon appetit! The ideal, uhm.. lightweight summer dish.. If you substitute some of the ingredients here with more healthy stuff. 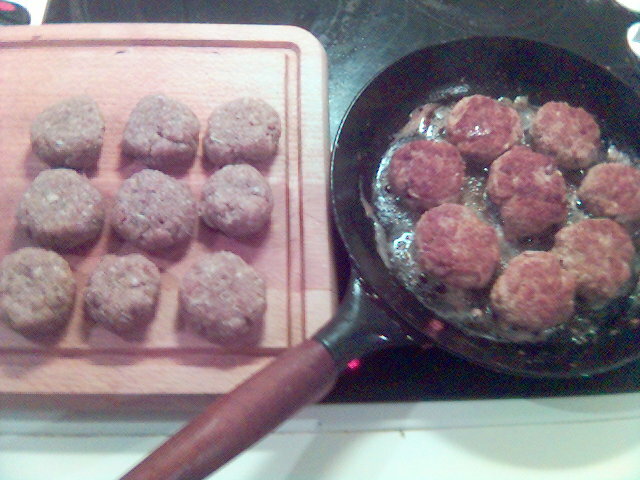 The meatballs I'm making here are the classic Danish meatballs or 'frikadeller', not the same as in my last recpie at all, but there aren't that many english words for the varieties of meatballs. I also apologize for the crappy image quality. 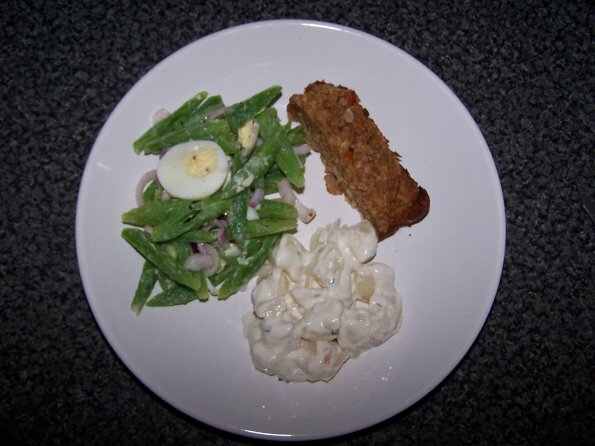 I might do this dish again when I get my new nifty digital camera next month. Before you start on the meatballs, get the pasta cooking, and when it's done, put it in the fridge to cooldown, the point is not to have hot pasta for this. So, now mix it and add the breadcrumps (or flour or oats) to bind the fat and liquid. Be careful not to add too much or too little, that will make your meatballs either too wet/have bad consistency, or be too dry/hard. When you've mixed it together, put it somewhere safe and slightly below room temperature to rest while you turn your attention to the other things. Get another bowl, put in the cream cheese and the creme-fraiche, either using a spoon or (better, since it tends to lump otherwise) an electric mixer/whisk until the general consistency is slightly less light than what the creme-fraiche was. Season with pepper, salt and sugar, then grate or crush some garlic (more than you used for the meatballs) into the mix. Next wash and clean the herbs (dill, parsley, chives), and put it in a glass together, using a scissor to turn the herbs into a kind of fine paste. Pour the paste into the bowl. Mix it all together and taste, adding additional seasoning as you wish. The sugar should take a little of the sour taste of the creme-fraiche. So far so good. Now we need to fry the mushrooms and the bacon until both are crisp. Don't do both of these at once, or disaster will happen, as the mushrooms let out quite a bit of water. So, preheat a pan on 2/3 or slightly more of the max. setting, pour a little olive oil (just a little) into it, wait until it is hot, then put in the mushrooms, turn them around often and wait. At some point, the mushrooms will be more like boiling than frying. 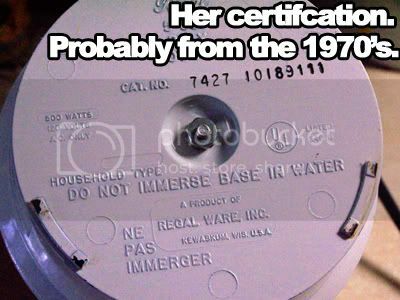 When that happens, take out the water with a spoon and pour it into the bowl. It should add flavour. The mushrooms will now begin to sizzle. Stir often to avoid them becoming ash on one side, and put it all into the bowl when they're done, before adding the bacon to the pot instead. The bacon will turn crispy quickly, but will also let out a lot of sizzling fat. As the bacon turns crispy, take it and put it into the bowl, but leave the sizzling fat on the pan and turn down the heat to around 1/3 of max. or slightly above that. 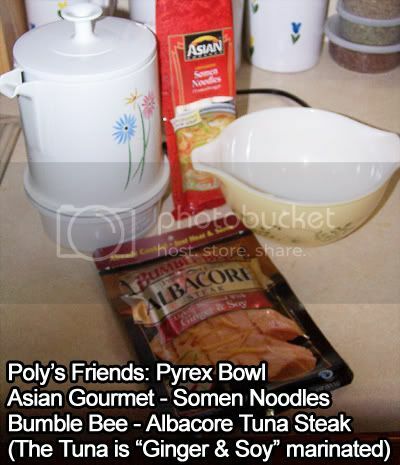 Mix the contents of the bowl again and put it into the fridge to cool it. 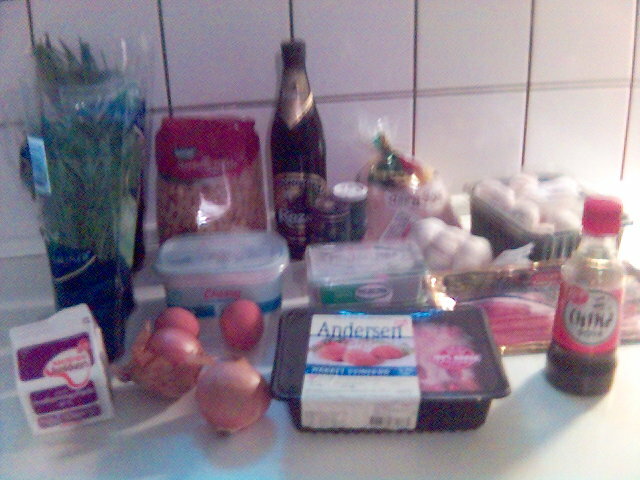 Now it is time to make the famous danish 'frikadeller'! Soooo.. Now you're getting there. It's time to begin serving the food. Mix the pasta with the concoction in the bowl. If you don't plan on eating everything in one go, don't mix all of it, or the pasta will seem more dry the second time around. Keep the stuff in the bowl until you need it, then mix it. 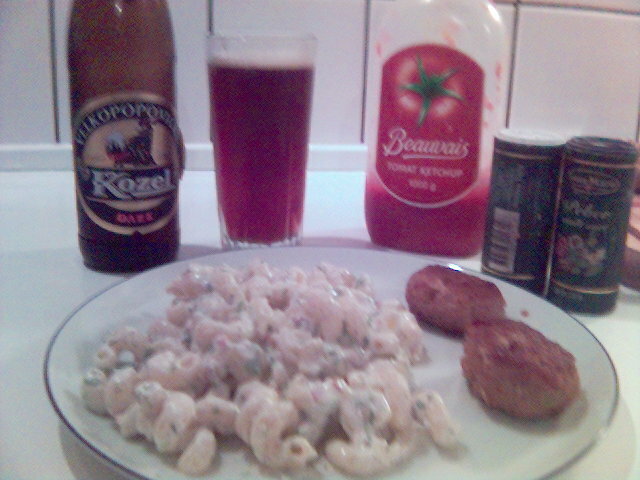 Open the beer which should preferably be very well-chilled (the Kozel beer from the Czech Republic goes very well with this dish), pour it into a glass, put pasta salad and meatballs on a plate, and voila'! Something for the hot summer You can use a little ketchup to spice this up. But only a little! It would be a shame for the fine food otherwise. - Thanks to Emaelle for helping me find the elusive english cooking words. - I'm sorry about not posting my pizza dish, but NUALA!! somehow lost the pics.. Yes, she did.. Not I. No. So that will first happen when I do that dish again. [big]Oven Dish with Fennel Root. [/big] (for 2-4 people). • Fennel roots (4-6 of them, depending on their size). • Whipping cream (that is not whipped yet ). About 500 ml. of it, less if you like. • Grated cheese, about 400 grams. • Ham cubes or something like that (small pieces anyway, the shape is not all-important). Pre-heat the oven to about 200 degrees Celsius. Cut up the fennel roots into smaller pieces that you could stick into your mouth and chew without needing any more knives during your meal . Boil them for 5-10 minutes, let the excess water leak out. Put the whipping cream in a bowl with the egg(s) and mix them together well. 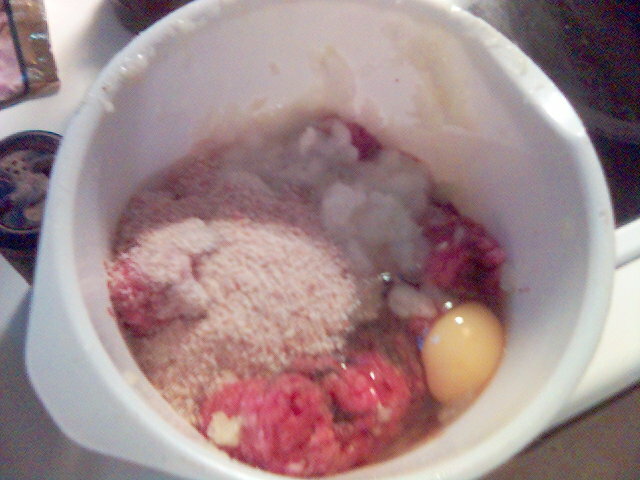 Mix in the grated cheese and the ham cubes as well. Now, put the cut-up fennel root together with the whipping cream mixture into a bowl that can go into the oven. Put in pepper, nutmeg, and curry (how much depends on your tastes). Mix it all up together. Put the bowl in the oven and leave it in for about 45 minutes. If, when you take it out, it’s all still too watery (the whipping cream stuff is supposed to mix with the cheese and get sort of semi-solid), put it back into the oven for a bit longer, until it’s right. If the top is threatening to become too dark, put a bit of tinfoil on top of it. Or use less whipping cream next time . 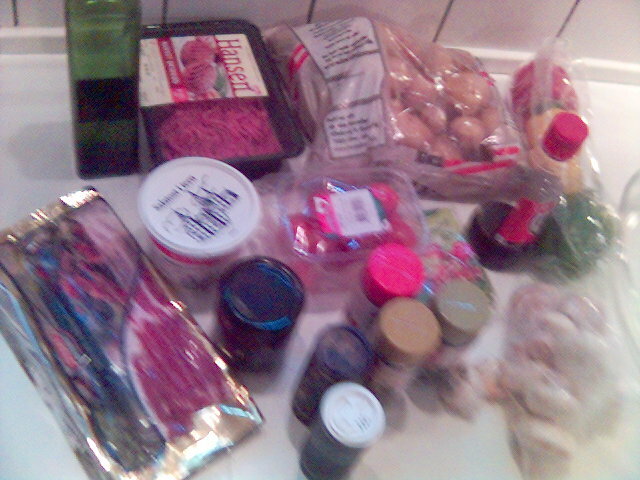 This is enough for.. Let's say 3-4 persons, and preparation time is around 1 hour. So, after making my previous recipe I had some mushrooms and bacon leftover, and I decided to use those in my next dish, which turned out to be somewhat freeform, so it is not supertuned/optimized like the others are, I'm afraid. Still, it tasted good, so here goes. Start up the oven at around 200 degrees before moving to the actual dish-making. 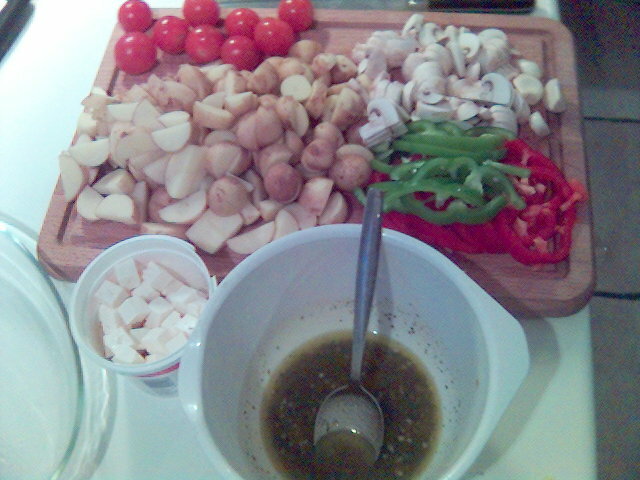 Then pick a large bowl where you make the spice/oil mix needed. 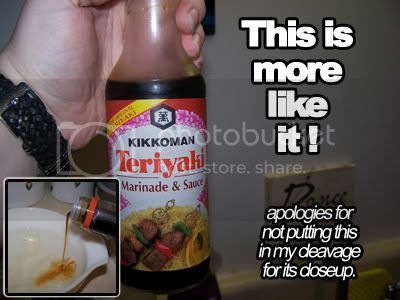 I used 2 packages of 'Knorr Tomato Salad Dressing'. That's partly me being lazy, but also partly me acknowledging that you can't make this much better yourself. You can however use any oilbased salad dressing solution instead if you wish. Anyway, it tells you to add water and oil into that mix, but don't use much water, there will be plenty of water from the vegetables. Don't skimp on oil though. Mix it all together, then wash and scrub the potatoes (don't peel them), cutting them into fitting, small pieces. These pieces you put into the bowl, mix it well with the dressing, then put it all into a pan which you put into the oven. It will need some time in there, how much is a bit relative, depending on water and size of the potatoes, but from 40 to 60 minutes. You'll need the vegetables in there too of course, but they need a little less time, so you can begin chopping them up while the potatoes are in the oven. Mix the last package of salad dressing mix in the bowl, cut onion, pepper, mushroom and cherry tomatoes in pieces, then mix them in the bowl. 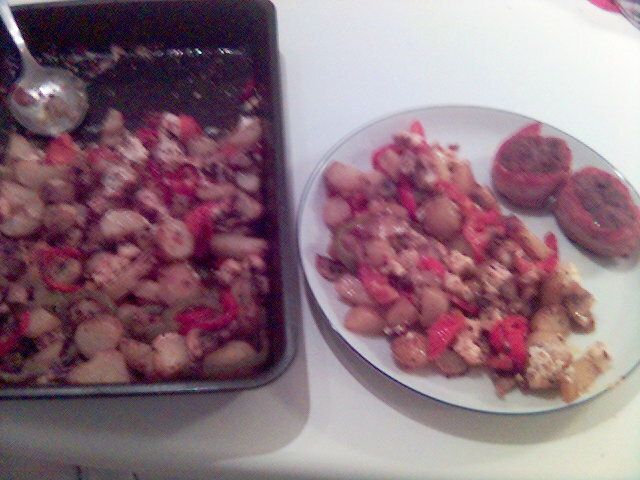 Take out the potatoes after 10 minutes and add the vegetables, feta, chopped garlic, and a little dried tomato pieces. Mix it, put it into the oven again and watch it for the rest of the time. Drain excess water if it is more than just a little (and it will be). So, while that is going on, I prepared the meat. 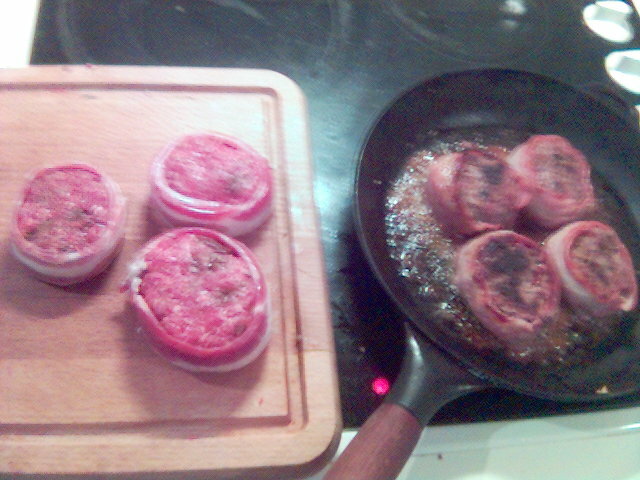 You can of course eat many other things with this dish (fish for instance), but what I wanted and had was minced ox and bacon, so I made beef with wrapped bacon around. I used salt, pepper, some of those dried tomatoes (for fun mostly), garlic and even some of the drained water from the potato dish. That's just me being weird though. It can be done in a variety of ways. Simmer it and time it to the dish in the oven as best as you can. Then, there's not much left but to serve the food.. Enjoy! The way I make it, anyways. Many variations out there. Chop up the olives, capers and garlic very finely (easiest if you have some kind of kitchen machine). Put it in a bowl and add the parsley and pepper, mix it all together very well. add lemon juice and olive oil, mix again. Olive tapenade can be used for many things, in many recipes. Its most well-known use is probably as a party snack, on crackers. It's also nice on toasted bread. Tomorrow I'm going to try it in a sweetpotato oven dish. Preheat the oven to about 225 degrees Celcius. Peel the sweetpotatoes. Cut them into slices of about 1 cm thick. Make diagonal cuts on the slices (as on the picture) (so you end up with a lot of little squares on the slice). Put the slices into or onto something fairly flat that can go into the oven, but that does have upturned corners so the olive oil doesn't drip off ont othe bottom of the oven. Put royal amounts of tapenade onto the slices and then put them into the oven for about 30 minutes. I just tasted it and I have to say, it was absolutely delicious . So, I keep helping DH with food stuff, and am always impressed with the things I see here.... not enough to actually make them, but hey. I can dream of it, right? I'm a lazy American. Maybe not as lazy as some, but definitely lazy. Mine, though female, is the life of the bachelor. I come home, peel off my shoes, shirt, socks... and usually end up popping a Hot Pocket in the microwave. But tonight... I cooked! Wow, it was a crazy night. 15-20 minutes (including photo taking time - 40 minutes to prep them for this post) versus the 3 minutes for a Hot Pocket! All in pictures - may your deity help your connection. Hopefully the laughs will be worth it. If not, please don't hurt me... too much. 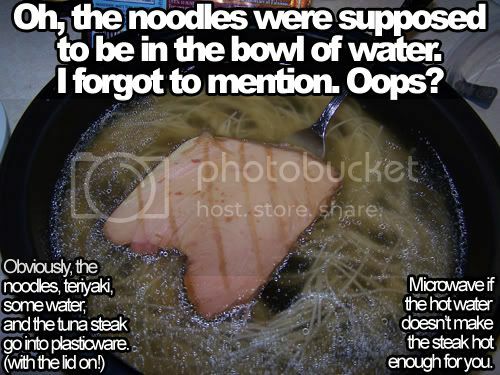 "Some Cheap Asian Noodles, and Discontinued Tuna Steak." Prep time: 15-20 minutes, with goofing off. Cost: $1.97US for 6 noodle servings. $1.96US for the single tuna steak. Peel the sweet potato, cut it into big chunks, and boil it until it's soft, but not falling apart (stick a fork in it to test). Preheat the oven to about 200 degrees Celcius. Put the potato chunks into a bowl that can also go into the oven. Put in the milk, butter, pepper, salt, nutmeg and cinnamon too. Mash that all up. Ground up the hazelnuts until they're powdery (or buy them that way). Mix that in with the mashed potato. Sprinkle almond shavings on top. Put into the oven until the almond shavings are nicely browned. I just ate this with ostrich steak and some beans for vegetables. It tasted very good. This was far tastier than I imagined it would be. Eats well cold as well as warm. A teaspoon is equivalent to 5mls. 1. Preheat an over to 190C/375F. Grease a 450g loaf tin with butter. Line with greaseproof paper if you have it or can be bothered. I don't and can't. 2. Fry the onion in the butter for 10 minutes until soft, and then add the tomato and mushrooms and fry for 2-3 minutes. 3. Stir in the flour, cook for a minute or two then add the stock and stir until thickened. Mine didn't really but it still looked and tasted great! Remove from the heat and add the remaining ingredients. Season with salt and pepper (push it, push it!). 4. Spoon the mixture into the prepared tin, level the top and cover with a piece of greased foil. Bake for 45 minutes until firm in the centre. Take off the foil for the last 15 minutes so that the top can crisp up. 5. The book says: 'Let the loaf stand for 4-5 minutes, then slip a knife around the edges and invert onto a warmed serving dish.' Ha ha, right. I'm always wary about inverting anything as it invariably ends up with a disaster and me having a hissy fit. I attempted it, but either as a result of my disregard for the extra breadcrumb coating instructions (which I haven't even given you!) or the non-thickening part of my experiment, nothing budged. The run-a-knife-round-it and sort-of-scoop-it-on-to-the-plate option worked well enough though. - What I suspect is about 100-200 grams of butter, depends a bit on your tastes. Now, we come to the kwark conundrum. We Dutch people eat loads of it, but I have never seen it in other countries (no, cottage cheese is not the same, even though many people and various dictionaries will tell you so). I suggest either finding Dutch kwark, or using greek yoghurt or any other kind of thicker yoghurt instead. It doesn't taste -that- different. After you add the flower, it shouldn't be a tough dough. It should still be a bit more like cake batter, but somewhat firm. It should take a bit of effort to stir your spoon through it. The kwark (possibly yoghurt) is supposed to make it a bit thinner again after you add it as the last ingredient. Thin enough to pour it out into the bowl, but not runny like a liquid. Take out a square or round low oven bowl thing, should be about 20 centimeters across. Put some butter or bakingpaper in to keep the brownie from sticking to the bowl. Put the butter in a small pan/pot and let it melt (don't let it fizzle or go brown) on the stove (low flame). Add the cocoa powder to the butter and stir it in well. Remove from stove. While the butter melts (or before), put the suger, vanilla sugar, salt, and egg into a mixing bowl. After removing the butter and cocoa mixture from the stove, add it to the sugar, and stir it all with a spoon. Add the lemon juice and stir that through too. Now add the flour and stir that through until it's very well mixed (no lumps). Then add the kwark (or yoghurt) and mix it in well too. Pour it into the bowl, and sprinkle some almond shavings on top. Put it into the preheated oven for 25 minutes. **Will put up a picture next time I make it. I added pictures to the Brownie recipe and the Fennel Dish recipe. 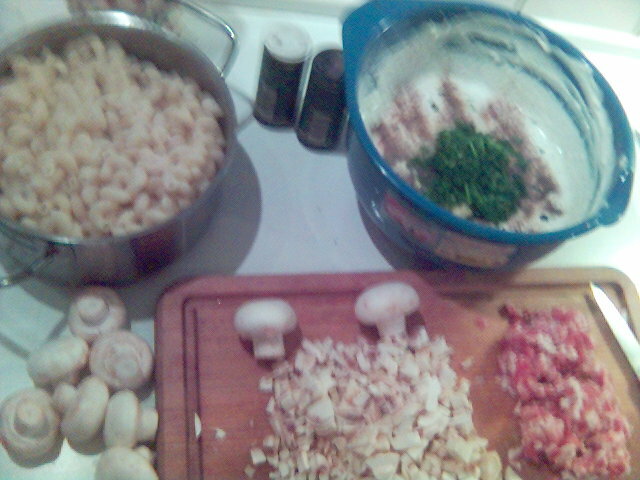 Chop up the mushrooms, garlic and onion into very, very fine pieces (I just use the kitchen machine or something like a stick blender). Put that into a frying pan with two tablespoons of olive oil, and fry it while stirring. At the same time as frying the mushroom mixture, bring the bouillon to a boil in a different pan. After frying the mushroom mixture for 5 minutes, add the bouillon and the whipping cream to it. Also add salt, pepper or any other herbs you like. Boil this until you think it is thick enough; don’t forget to stir occasionally or it will burn. In a spoonful of olive oil, or in the fat that the bacon will naturally release, fry the garlic and the bacon (in a wok or frying pan). Add the chickpeas, and a bit later, the spinach. This doesn't have to be in the frying pan for long, it all just needs to be heated up. Near the end (when it's almost hot enough), add the tomatoes and heat it all up a bit more until it's done. If you're not adding any bacon, you might want to use some salt. -You could also not fry the garlic and add it to the dish raw afterwards, after the rest is already cooked. This will give the dish a stronger garlic taste than when you fry the garlic first. cm wide. Roll up each strip. Put the rolls into the oven until they are done. If you don't know how long to put them in, check up on them often or look up baking times and such for small breadrolls and such on the internet. Will edit post for picture(s) later. I made these this year and everyone liked them (so if you like cookies in general you'll probably like these ). Preheat oven to about 170°C. Put the butter and the sugar in a bowl, and beat them together for a while (I use an electronic hand mixer, highest setting). Add the egg, the honey, the baking powder, a pinch of salt, the ginger and the cloves to the butter and sugar mixture. Beat everything together for a while (again). Add some flour (dont start with too much), stir that in with a spoon (or use your hands). Repeat this last step until the dough is the right consistency; meaning, until it isn't very sticky anymore, you need to be able to roll out the dough with a rolling pin (or with your hands) to cut shapes out of it without the dough getting completely stuck on the rolling pin (or your fingers). Cut nice shapes out of the cookies (I like doing stars and moons; I cut the shapes out of some cardboard or whatever, and then put them onto the dough and cut around them with a sharp knife to get the shapes I like). Or just roll flat round cookies, or whatever you like. Put cookies in oven for about 15-20 minutes. When the cookies have cooled down entirely, it's time to prepare the icing. Put the white of 1 egg into a bowl. Add the icing sugar a little bit at a time, while beating/whisking with a small whisk. After that, whisk in the lemon juice. Heat the mixture for just a bit (I put it in the microwave for 30 secnds, highest setting). Let it cool a little bit, then beat it with an electronic stickmixer or handmixer, until it's nice and thick (think enough that it won't dribble right off of your cookies before it's dry when you decorate them). If it won't thicken properly, add more icing sugar. Now put it on your cookies. I use this flask that you can squeeze that has a pretty small opening to 'draw' decorative lines onto the cookies. Icing bags or icing syringes don't work so well for me when I have to make cookie decorations, the stuff just comes out in big blobs and I have to use both hands to operate the things so I can't hold the cookie.... it just doesn't work. Wait a while (a few hours for me) for the icing to dry (or just eat them while the icing isn't dry yet ). 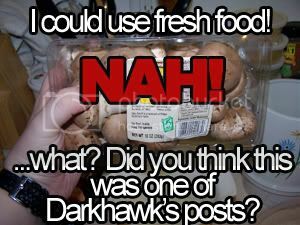 This will serve two people or one Darkhawk. Wash the courgettes, and cut them up (lengthwise) into slices of approximately half a cm thick. Mix olive oil, lemon juice, minced garlic, salt and pepper in a bowl. Put some of this mixture on both sides of a courgette slice, and put it into an oven dish (put some non-stick paper underneath it so it won't stick to the dish/bowl/whatever you're putting it in). Do this with every courgette slice. If you have too little of the marinade, make some more. If you have some marinade left at the end, just pour it over the slices. Let the slices sit for 5-10 minutes, then put them into the oven until the top ones are slightly brown (or until you think they're done). If you like, you can easily add other ingredients to the marinade, like chopped up fresh herbs (I had a great time with thyme). Two eggplant recipes. Unfortunately not my own, I just took them off a recipe site. Mix the honey, cheese, garlic and chives into a very thick paste. Use as much of honey and chives as you like (I like a LOT of honey through the cheese, but not everyone does). Put a good amount of the cheese paste onto each slice, roll them up and skewer them. We have pretty large wooden skewers, so for us we could put 4 rolls on a skewer. Grill the skewers (you can also just put them in a frying pan, I tried, but will miss a certain taste) until they're done. Should be fine to just get them good and hot, if the eggplant slices turned limp enough with the salt. Preheat oven at 200 degrees Celsius. Grease an oven dish. Cut up the nuts and garlic into small pieces. Put the cut up nuts and garlic, the cheese, the tomato puree, salt and pepper into a foodprocessor (or use a stickblender or whatever) until it's well-mixed and the least chunky that it can get. Divide the paste over the slices (just take a knife and smear it on). Take the oven dish and put a layer of slices in there. Sprinkle a bit of olive oil over the slices. Then put another layer of slices on top of the first, sprinkle that with olive oil too.... etc etc. When done, pour the cup of water over the layers. 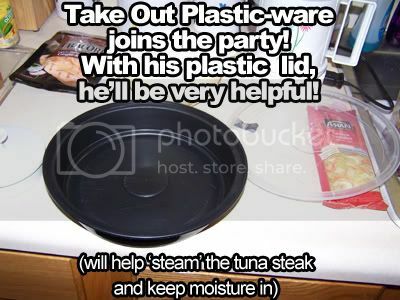 Seal the oven dish with a lid or with aluminum foil (shiny side down) if there is no lid. Put into oven for 30 minutes. Alright, time for a new recipe from me. Not incidentially, my last post here was when I had just gotten a job, 2 years ago Now that I'm free again, there'll be more time for such stuff. In the meantime I've come clean, and now I'm a calories obsessed, thin crossbreed vegetarian/vegan hippe.. Some days. Thus, here's a simple, quickly prepared (10 minutes) low-calorie but nourishing recipe. Ladies and gentlemen, without further ado, I present to you.. Put the eggs in a bowl, add milk (two tablespoons or so), tarragon, salt and pepper. Mix it to one mass. Cut the breadroll and toast it (it's best if it's not hot when served, so don't worry about that). Heat a pan with some butter. Medium heat. Pour in the contents of the bowl and let it simmer and solidify somewhat, but keep the consistency creamy. Then crumble in some of your preferred goatcheese. You'll best know how much you'd like yourself. Put the tomatopaste on the cut halves of the roll (note, in the picture I use olive tapenade instead of concentrated tomatopaste, but after some experimentation I find the different tastes complement each other better with the tomatopaste - it's too bitter with both goatcheese and olive tapenade). Put the mix from the pan atop the bread. Et voila! Instant meal for one, or a snack/appetizer/starting course for two. This dish should have around 500 calories in total. Put something green atop it, if you want to be artsy. And another one. This one is a simple, yet filling and pretty tasty soup. Note: You'll need a blender for this. Chop the onion, garlic and chili. You can be rough here, it's ok, it'll all get mangled in the blender later anyway. Pour some olive oil in a pan, medium heat, then cook the vegetables until they've been softened up. Meanwhile, drain the kidneybeans and have the vegetable stock ready. Now pour in the beans, stock, lemon juice (just a squeeze, maybe a tablespoon or so), Worchestershire sauce (2 tablespoons or whatever, depending on your preference) and 4 tablespoons of tomatopaste. Mix, bring to a boil, cover and simmer for around 15 minutes. With lid if you want a thinner soup, without if you want it a bit thick. Now put the soup in your blender, you're probably best off doing this in two stages, or it might splatter all over. Blend until it's all smooth, then pour it back into the pan and season with salt and pepper. There you have it. Serve with bread and again, something green on top for more visual points. A simple, tasty and quick dish to make. And this recipe yields around 1.5 liters of soup, at a total of around 800 calories (minus bread). That should be enough for around 3 people. Prepare the dried chick peas by soaking them in plenty of water overnight, for about 10-12 hours. 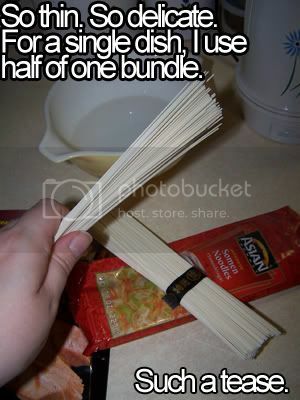 Then boil them for about 2 hours. Wash them well, several times, before soaking, before boiling, and once after boiling. 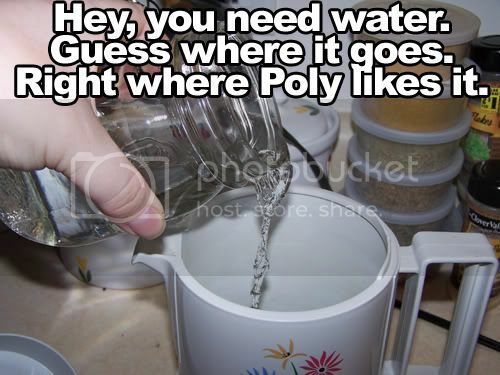 Save the water you boiled them in after boiling. For canned peas, heat them in whatever goo they were canned in, and save that (like the boiling water of the dried peas). Put the peas, after cooling a bit, into a food processor, or into a bowl if you don't have a food processor (will mash them with, for example, a stick blender, or an old fashioned mashing stick if you have to). Put the garlic in with the peas, pre-crushed or cut if you do not have a food processor. Add the tahin, the olive oil, the crushed cumin and a few tbsp of the boiling water you saved to soften it up a bit, then mash the things into a puree. Squeeze the lemon, add the juice to the puree. Add salt, pepper and any herbs to taste. If the hummus is still too thick for your tastes, add more of the boiling water. Spaghetti with olives, and french baguette. mango with cinnamon, dry banana and a cat/rabbit in gingerbread with some touch of raspberry jam. ... or: what can I make of whatever I have? Make a sacue of the chopped tomatoes, kidney beans and some kethcup in a pot. Add salt and pepper. Boil the eggs with the pasta and some salt and olive oil until the pasta is done (the eggs will be hardboiled at this point). Peel the eggs and cut them in half.